One gigabit per second (1Gbps) fiber connections like those offered by Google Fiber is considered the Holy Grail of broadband in the US. The truth of the matter, however, is that Americans lag (no pun intended) far behind other countries in terms of Internet speeds. Take South Korea, for example. The nation’s current average broadband speed is 100Mbps which enables users to download a 1GB file in around 80 seconds. That’s certainly nothing to scoff at although it pales in comparison to what’s just around the corner. 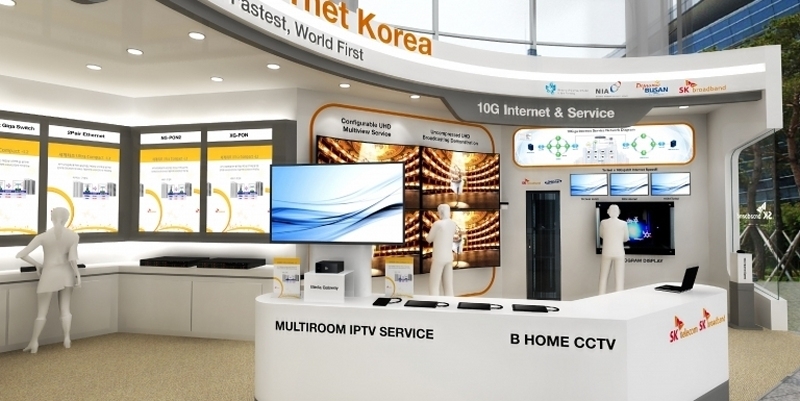 One of the nation’s largest broadband service providers, SK Broadband, will be introducing its new 10Gbps fiber service on October 20 at the Plenipotentiary Conference of the International Telecommunications Union at the Busan convention center. If you’re keeping up, that’s 100 times faster than the already fast 100Mbps average that South Koreans enjoy. With it, customers will be able to download the aforementioned 1GB file in just 0.8 seconds. The latest advancements in broadband technology typically come out of countries like Japan and South Korea, a fact that citizens are very proud of. Natsuki Kumagai told Stop the Cap that the world watched NASA send men to the moon in the 1960s and many grew up amazed at the constant advancements of the Americans. Now, however, the Americans are the ones doing the watching. Pyon Seo-Ju echoed those sentiments, highlighting how slow and expensive Internet access was during travels to the US. How fast is your home Internet connection? Let us know in the comments section below!